Gas and bloating can cause a lot of embarrassment and discomfort. Indigestion, abdominal aches and pain, odorous flatulence, and burping are just some of the reasons to look for ways to prevent feeling bloated. Some of the best foods that help with bloating and gas are peppermint, ginger, chamomile, and apple cider vinegar. Apart from adding anti-bloating foods to your diet, there are other natural remedies that can help flatten your stomach. For example, activated charcoal, probiotics, and certain herbs all help stop gas pains in the stomach. To help prevent feeling full and gassy, you should also avoid foods that cause bloating. In this article, you will learn about foods that reduce bloating which you can incorporate in an anti-gas diet. You will also find out what to eat to get rid of gas quickly and help get a flat stomach. Flatulence, or gas, is part of the natural digestive process when food breaks down in the intestines. What should you eat when you feel bloated and gassy? Let’s look in more detail at some of the best anti-bloating foods that should help you get rid of gas and bloating. One of the best remedies to help get rid of gas and reduce the feeling of pressure in your stomach is chamomile. Chamomile is well-known for its soothing carminative properties on the mind and the digestive system. To use chamomile tea to help you feel less bloated, put 1-2 teaspoons of dried leaves into a cup and pour in boiling water. Cover and let it infuse for 10 minutes before drinking. Consume the herbal anti-gas remedy 3 times a day to help relieve gas pain and bloating. For more about the amazing health benefits of chamomile, please read my article on how chamomile tea can help give you great health. Peppermint is one of the foods that helps with bloating and gas because it reduces a gassy buildup in the intestines. To help get rid of feeling that you have a bloated and gassy stomach, drink a refreshing cup of peppermint tea. Put a few fresh peppermint leaves in a cup and pour over boiling water. Cover the cup for 10 minutes to prevent the peppermint essential oils escaping. Drink 2-3 times a day to help relax and get rid of gas pains. Ginger is a food that reduces gas and helps with bloating because it has an anti-inflammatory effect on the digestive process. All you have to stop gas naturally is make ginger tea by chopping or grating a 1-2 inch piece of ginger. Put in a cup and pour in boiling water. Cover and allow to steep for 10 minutes. Consume this anti-gas drink about 20 minutes before each meal to prevent bloating and gas after eating. There are many other health benefits of using more ginger in your diet that you can learn about here. You can also use dried ginger as a powerful health tonic. Turmeric is referred to as the golden spice and can do wonders for your digestion and helping to relieve gas and bloating fast. If you are feeling gassy and bloated you can get relief from a warming and soothing turmeric and ginger tea. Put a ½ teaspoon each of turmeric powder and ginger powder in a cup of boiling water and mix well. Steep for 5 minutes and leave to cool for 10 minutes. Then add a teaspoon of honey and a pinch of black pepper to help turmeric absorption in your body. Drink the herbal tea 2 times a day to help quickly reduce bloating and gas. Learn more about the many ways that curcumin (turmeric) can help to boost your health and reduce inflammation. Probiotics help reduce the volume of intestinal gas and can help reduce bloating, abdominal pain, and smelly farts. The reason why probiotic supplements and probiotic foods relieve gas and bloating is that they promote healthy bacteria in your gut. Learn about some reasons why taking probiotics can be good for you, including to help strengthen your immune system. You could also try the fermented milk drink kefir as it contains healthy enzymes and probiotics that also help fight gas. If you want to follow a low gas diet, you should start your day with a glass of diluted apple cider vinegar. To help prevent gas and bloating after eating, dilute a tablespoon of apple cider vinegar in a glass of warm water. Consume before your lunch and evening meal to help eliminate a buildup of gas after eating. If the apple cider vinegar remedy is too sharp-tasting, try adding a spoon of honey to boost its health benefits. Find out how much apple cider you should drink every day to boost your health naturally. Taking activated charcoal can help get rid of gas pains in your stomach and deal with bloating. Learn more about the many uses of activated charcoal in getting rid of gas, whitening your teeth, and reducing cholesterol. Anti-bloating foods that contain cinnamon can really help to eliminate the root causes of gas and bloating. Learn about more ways to incorporate cinnamon into your diet if you want regular relief from bloating and gas. One of the many foods that eliminate gas is caraway seeds. To use caraway to fight gas and bloating, crush up 2 teaspoons of caraway seeds and add to a cup of boiling water. Allow to infuse for 15 minutes, strain, and drink up to 4 times a day to help reduce bloating and gas. Lemon balm is an effective digestive remedy for reducing bloating and gas quickly. To make an anti-gas medicinal tea with lemon balm, put a few fresh leaves in a cup of boiling water. Cover and allow to infuse for 5-10 minutes before consuming. 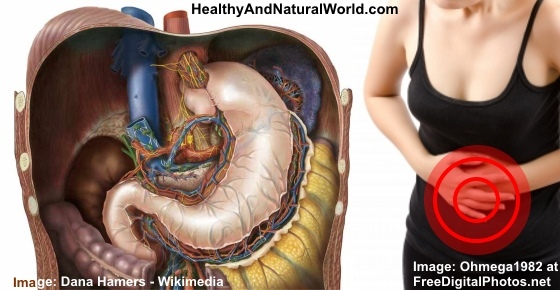 Drink the herbal preparation 3 times a day for gas and bloating relief. If you suffer from chronic digestive conditions, it is important to consume foods that don’t make you bloat. Many IBS sufferers have found digestive relief from the FODMAP diet which contains non-bloating foods. The type of anti-bloating foods on the FODMAP diet are ones which don’t ferment easily thus reduce the volume of gas in your intestines. You can also eat bananas on the FODMAP diet because bananas don’t cause gas. The best way to avoid a buildup of gas and a bloated stomach is to eat foods good for your stomach. You should also eat food slowly to give it time to digest property and prevent overeating. Eat and drink slowly. Eating slowly gives your digestion time to work properly and stops you from stressing. Also, you swallow less air when you eat and drink slowly. Avoid trigger foods. If you find that after eating certain foods your symptoms of gas and stomach aches are worse, you should avoid those. Some common foods that cause gas are cabbage, beans, dairy, and fructose. Walk after a meal. Going for a moderately-brisk walk can kick-start your digestive system and prevent food fermenting gasses in your gut. Reduce your intake of fatty foods. Foods high in fat are not only bad for your heart but they also put the brakes on your digestion. One way to help get rid of gas and bloating is to avoid dairy products if you are lactose intolerant. Doctors say that many people have trouble digesting lactose – a type of carbohydrate in dairy products. Problems digesting lactose can cause a large amount of flatulence to accumulate in the intestines and give your stomach a bloated, distended look. To make sure you get enough calcium in your diet, you can try some of these non-dairy calcium-rich foods that won’t cause gas or bloating.